Cute cartoon animals, physics-based puzzles, and a star-based rating system—sound familiar? 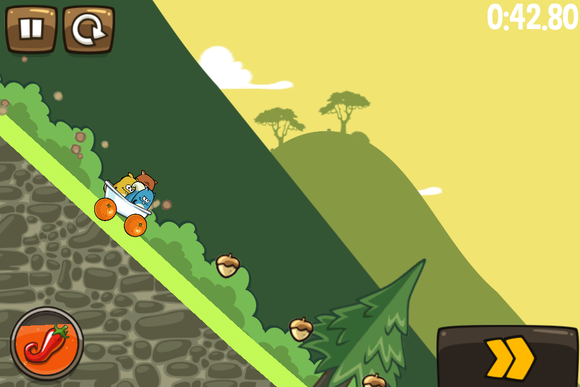 Noble Nutlings for iOS is a bouncy, cart-swerving drive down memory lane. Boomlagoon, an indie team that happens to be made up of many ex-Rovio (of Angry Birds fame) developers, is the development brains behind the physics-based Nutlings. The interface, art style, and the build-a-contraption and obstacle course gameplay mechanics are reminiscent of Rovio's recent venture, Bad Piggies. The free Noble Nutlings tasks you with guiding three squirrels out on a joy ride through various obstacle courses. Using the iPhone, iPad, or iPod touch’s accelerometer and virtual buttons, you can earn star ratings on each level; you can also unlock new equipment, wheels, and power-ups. The physics are consistent, the controls sharp, and despite the cartoonish equipment (you'll have a cart made of a bathtub chassis and riding fruit wheels at one point) the game is challenging enough even for adults. The physics-based puzzles feel oddly familiar. The issue with Noble Nutlings is that's its nothing spectacular. There are dozens of similar tilt-to-guide physics/race/puzzler games on the App Store, and BoomLagoon seemingly swapped in squirrels for pigs or birds. Like Rovio's team, BoomLagoon seems to be trying to recapture Angry Birds' winning formula of challenge, cuteness, and replay-ability. While it's not going to ignite a new craze, Noble Nutlings is an above average puzzler that I fully admit to enjoying more than Bad Piggies. While it's not going to ignite a new craze, Noble Nutlings is an above average puzzler with cute cartoon animals, physics-based puzzles, and a star-based rating system.